Click HERE to Enter our Facebook Contest to WIN 2 Tickets!!! Looking for a swanky affair? Want to avoid the crowded bars? Join The Redmont (Rain or Shine) for their inaugural New Year's Eve Bash! 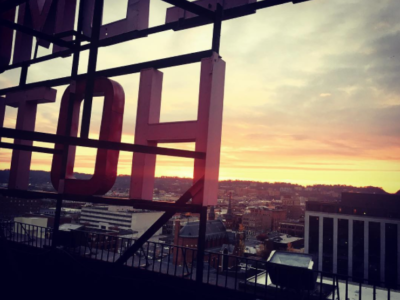 Harvest Restaurant & Bar will also feature a four-course prix fixe meal or you can enjoy views of the city's skyline while waiting to ring in the new year on The Roof! Tickets include complimentary small bites, a dessert bar, and bottomless glasses of champagne. DJ Ulises will be providing your musical entertainment and a countdown on The Roof, along with party favors to compliment your celebration! Click here for more info. Click HERE to purchase tickets! Sky Castle Football Playoff and NYE Celebration! 2pm: Alabama vs Washington game / 6pm: Clemson vs Ohio State game! After football you can enjoy a champagne toast at midnight and great food and drink specials all night long! Click here for more info. Start to celebrate New Year’s Eve at Cantina! The jumbo screen will be airing the games and there will be beer and margarita specials all day! This is a great way to watch the game before heading out to celebrate NYE! Click here for more info. Check out the 2016 Peach Bowl Party at Saturn. This is an all ages event and the game will be airing on the giant projector screen! Enjoy some coffee, beer, or a Redbull while enjoying the game. Click here for more info. So long, 2016! 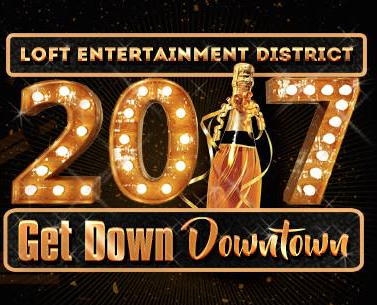 The Loft District is excited to announce the return of the Get Down Downtown New Year's Eve party. A $20 armband gets you in the door at 6 of Birmingham's hottest destinations. Purchase yours at any Loft venue, including The Collins Bar, Carrigan's Public House, Pale Eddie's Pour House, Rogue Tavern, Wine Loft Birmingham & Tavern on 1st. Click here for more info. Trim Tab NYE Circus of Love! Step right up folks, for the most spectacular and sensational night of the year! Goodbye 2016 and all of your woes, we're ringing in the new year with wild acts of love! Dress up and Get Down for the 2nd Annual Circus of Love featuring acrobats, fire dancers, djs, special brews, and surprises galore! This Vaudeville Circus is open to all, NO COVER! Click here for more info. Join BMR & Workplay for an exciting New Year’s Eve party! Featuring Neon Electric playing music from the 80's and 90's.There will be giveaways throughout the night and one lucky guest will win tickets to see the Red Hot Chili Peppers in ATL along with a hotel room! Click here for more info. It's time to #HEADTO2017 and ring in the New Year in Lakeview!! $20 advance armbands on sale now. You can bar hop from Tin Roof, Side Bar and Innisfree for one cover!!! (What a deal!) Plus they’ll have a Ball Drop on the Big Screen and the infamous FIREBALL toast at midnight! Click here for more info. Black Market Bar 5pts NYE Celebration! Join BMB 5pts this New Year's Eve to ring in 2017 in style! They’ll have live music from Sarah Green & the Sunday Lovers and The Memberberries going all night long! There will be a big champagne toast at midnight! They’ll validate all parking in the public deck on Magnolia Avenue. Click here for more info. The Black tie affair will be located in the Club Lounge of Regions Field and will feature live music, food, drinks, games, a raffle, the college football playoffs on multiple TV screens, an illuminated steel cage ball drop, and a fireworks show you don't want to miss! Additionally, the event will be aired live on ABC 33/40 throughout the night! Click here for more info. Come enjoy NYE with celebrated Jazz Saxophonist Steve Cole. This will be a laid back event, so you can avoid the crowds as you ring in the New Year! Click here for more info. Pies & Pints Brings Great Pizza and a Fun Atmosphere to Birmingham!